Zombie Apocalypse Survival Camp connects children to Indigenous culture. 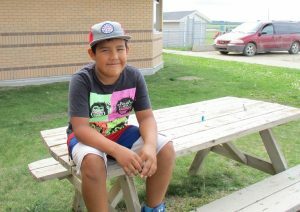 For ten-year-old Raiden from Muskeg Lake Cree Nation, participating in a Zombie Apocalypse Survival Camp sounded like it would be a lot of fun. Raiden had never been to a summer camp before, so he eagerly joined other children and elders in his community for a week this past July to learn how to live off the land. The creative name was used to attract children to participate. The camp was designed to bring children and elders together over shared learning of Indigenous cultural and land-based practices. 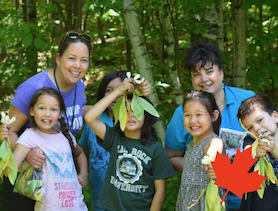 With help from their elders, children picked sweet grass and sage, worked on beading crafts, learned how to smoke wild meat and tan moose hide, and crushed sea shells to make traditional medicine. 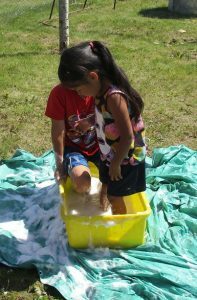 Campers learned how to tan hide by stepping on it in soapy water. The children also participated in a talking circle with elders where they shared stories, learned how to pray to the creator, and smudged with sweet grass. For elder Darlene, who helped out at the camp, it meant a lot to be able to pass on these traditions to children like Raiden. “[The children] learned about what happened a long time ago and what their ancestors did in the past and how they survived. Perhaps they will carry on these activities in the future, tanning hide, making pemmican,” Darlene said. The learning wasn’t just for children. “There is always something to learn from attending this type of function,” Darlene added. She learned how to tan a hide for the first time just like Raiden. The Zombie Apocalypse Survival Camp is supported by the Muskeg Lake Cree Nation. This year, Canadian Feed The Children (CFTC) joined with them as part of a new partnership through the development agency’s Healthy Bodies, Healthy Minds program. 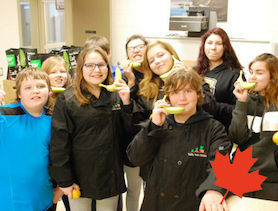 Muskeg Lake Cree Nation is one community in a cluster of communities from Treaty Six territory in central Saskatchewan that has partnered with Canadian Feed The Children to address food insecurity through community-led, land-based education. Neighbouring First Nations (Beardy’s & Okemasis, Ahtahkakoop Cree Nation) have also joined the Healthy Bodies, Healthy Minds program this year, an expansion of programming that has been funded by a generous grant from the Slaight Family Foundation. Healthy Bodies, Healthy Minds aims to reach 20 new Indigenous communities by 2020. Raiden says he feels prepared to survive a zombie apocalypse. *Originally printed in the 2017 Fall edition of DIRECTION magazine published by the Saskatchewan Parks and Recreation Association. 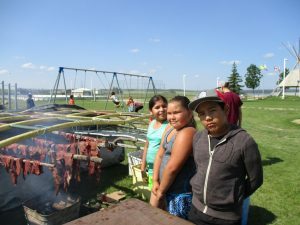 Traditional First Nations activities like food gathering are a fun and educational way to connect students with community Elders and their culture. 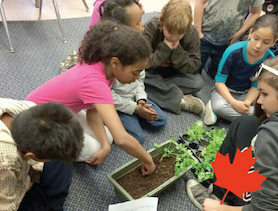 Supply a classroom with indoor garden supplies for students to learn about growing healthy foods and prepare for planting outside in the Spring.